Problems with DUS? Tell me! Have you seen this screen before? It seems not so many actually have. It is the nupgrade.exe 3 which migrates the personal local client data to notes. For the upcoming Redbook I will write the chapter on Nupgrade.exe and this is your chance to contribute! If you have experienced problems in the past (or may be experience them right now) - drop me some lines (you can comment here of cause as well). Also if you have some tips and tricks you can share regarding the migration using the nupgrade, you are being very welcome. to contribute. The last time I used DUS, I had so many problems, I contacted the IBM manager who was extraordiarily helpful. Unfortunately, the job was on a deadline (migrations only seem to happen within a state of panic)--so we switched to a commercial product. I would expect your experience in finding volunteers to be similar. here is, what I mentioned in our discussion today for your writing: The killer criteria is that the customer wants a smooth migration. 1st switch only the backend to Domino. 2nd give the Notes client little by little to the end users. The speed varys on the throughput of education they can give to their endusers. 1st) Domino plays backend for all users - just rollout damo - but there are public folders in place on the actual Exchange backend. So they need a replacement for public folders with addressbooks, groupcalenders and documents. But all solutions from differnet source are not of a piece. 2nd) Parallel operation of Domino and Exchange over longer period of time. But important databases (or just the data) have to be synchronised constantly. This is important again for addressbooks, calendars and document folders. Important is additionally that all the rooms and ressources have to be booked through both systems without conflicts and with availability check and so on. Thanks Jack for linking to this blog! First of all, I would like to say that I like the new parameters for server and mailfile!! I haven't really used the tool since 2003 when we were doing a Notes 6.0.0 rollout company-wide and moving all Outlook POP3 mail into Notes. At that time, we used this tool alone to migrate about 650 users to Notes/DWA. We basically didn't have any issues with it. We noticed that sometimes converted messages would have no body, but I believe I remember that these were from some previous holdouts who had been using Eudora and we had to migrate from Eudora to Outlook to Notes. I think the Eudora to OL caused the body to be stripped in some instances. The only gotcha I found with this was that if I did not deselect "Outlook Contacts and PABs" leaving only the "Personal Folders" option selected, then the migration would fail with an NSD. I attributed this to the fact that we weren't an Exchange environment but just POP3. I just wanted to give my positive feedback on the tool for our environment. Various times we've run into situations where the user has more than one profile or .pst file. Instructions on how to switch between the profiles in order to get all of the data migrated would be helpful. In addition, how to generate a .pst file with only the contacts and calendar so that it can be migrated without the mail. Also would be good to mention the tip about replicating your mail file to the local hard drive and renaming it to a_personalfolders.nsf before doing the nupgrade so that the migrated data can be easily replicated back to the server. Patty, with 7.0.1 (maybe 7.0), you can specify the server and path of the mailfile. This seems to have corrected the a_personalfolders hack that I had to use as well. When running the nupgrade.exe /3 command i get the following error... Error Launching N/3UPGD.EXE /3 - The system cannot find the file specified. Is there anything i missing out on ? When running the nupgrade.exe command i get the following error... Error Launching N/3UPGD.EXE /3 - The system cannot find the file specified. Problem is because you have not installed full notes components. During installation you need to choose 'migration tools'. Error i becasue some files are not exist. pgrade your notes installation and problem be sorted. Hi there. I am having this problem after the migration is over: the mail attachments are missing. Only mails with jpeg/gif/bitmap attachments are migrated corectly. 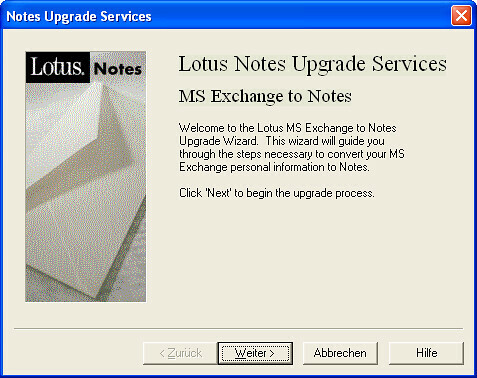 I am using IBM Lotus Domino Notes v 8.05. The migration is from MS Outlook, with nupgrade 3 wizard. All these things with Lotus still seem too difficult to me... In my education process, I will probably begin with your article. I add that Outlook Contacts being created in the mailfile with the New button are correctly imported as Notes contacts.